Cover crop use in North Carolina is increasing at a rapid pace, with over 10% of row-crop acreage planted with cover crops across the state (Southern SARE Survey, 2016). Weed suppression and fertility provision are some of the most attractive short-term benefits of cover crop use for growers. Small grain cover crops can produce substantial biomass with slow decomposing residues, which allows for weed suppression and soil moisture conservation in the following cash crop. Legume cover crops can provide substantial nitrogen to the following cash crop, but legume residues generally decompose more quickly and therefore are of limited value for weed suppression in the following cash crop. Legume and small grains can be grown in mixture to maximize the benefits of weed suppression, soil moisture conservation, and N fertility provision. 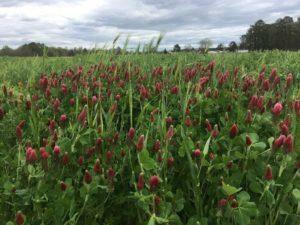 Crimson clover and hairy vetch are both legume cover crops that produce substantial biomass in North Carolina, however they both have disadvantages. Hairy vetch produces hard seed and this can create weed control problems in subsequent winter crops. Crimson clover experiences maximum growth on a narrow range of soil types. 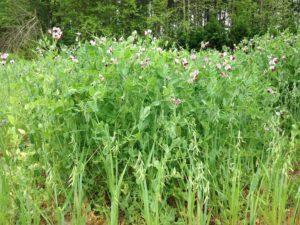 Winter pea is an alternative legume cover crop that can be produced in North Carolina and has the benefits of easy termination and no hard seed. 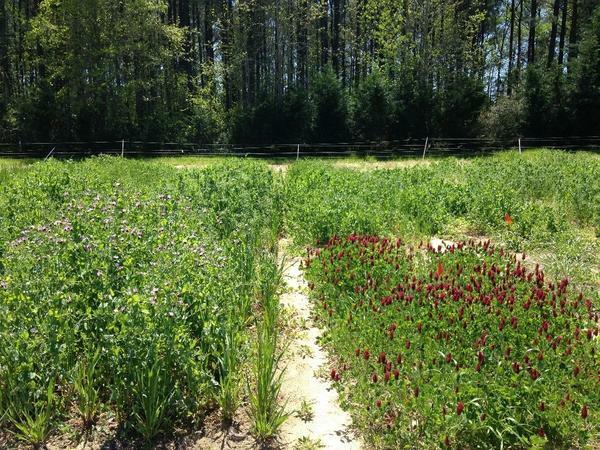 Limited work has been done comparing winter pea genotypes to crimson clover and hairy vetch for cover crop production in North Carolina and even less work has been conducted on legume biomass production in mixture with a small grain. Mixture plots at the Central Crops Research Station in Clayton, NC. 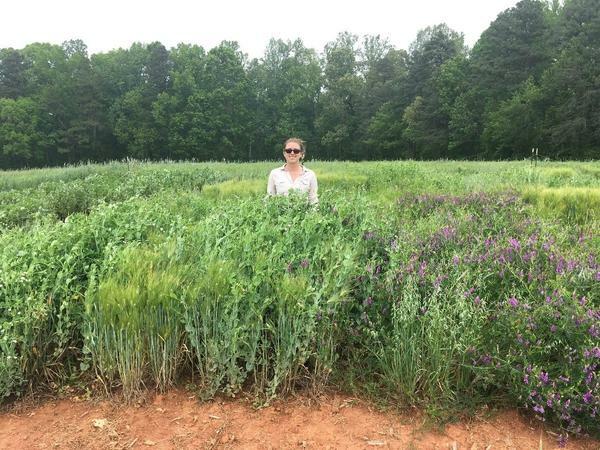 Pea and barley mixture plot compared to a hairy vetch and oat mixture plot at Piedmont Research Station in Salisbury, NC. The objective of this study was to compare five winter pea genotypes to crimson clover and hairy vetch for biomass production in mixture with various small grains. Studies were conducted from 2015 to 2017 at the Central Crops Research Station in Clayton, NC, the Caswell Research Farm in Kinston, NC, the Upper Coastal Plain Research Station in Rocky Mount, NC, and the Piedmont Research Station in Salisbury, NC. The Clayton, Kinston, and Rocky Mount sites are classified as Coastal Plain sites and had low soil residual N. The Salisbury site was characterized as a Piedmont site and had high soil residual N from higher organic matter coupled with nitrogen carryover from fertilizer applied to a previous corn crop. Four released winter pea cultivars: [CAH-11, Common, Romack, and Nature’s Choice (a cultivar readily available in North Carolina)] and one advanced winter pea ARS breeding line [PS0017018W] were compared to one crimson clover cultivar (AU Robin) and one hairy vetch cultivar (Purple Bounty). These pea genotypes were visually selected from a biomass screening of eighteen pea genotypes in North Carolina from 2014 to 2016. Each legume was produced in mixture with barley (cultivar=Thoroughbred), oats (cultivar=Gerard 224), and wheat (cultivar=NC Yadkin). Winter peas were seeded at 60 lbs/acre, crimson clover and hairy vetch at 20 lbs/acre, and small grains at 30 lbs/acre. The mixtures were drilled in 7-inch row spacing from late September through mid-October. Biomass (plant dry weight) was determined in early to mid-May when the small grain reached soft dough stage. Barley generally reached soft dough stage one week prior to oats and wheat. The cover crop mixtures were not fertilized. No herbicides were used and these mixtures were very competitive with weeds. Legume cold tolerance, legume disease incidence, and mixture biomass production. Legume cold tolerance: Generally crimson clover and hairy vetch were more cold tolerant than pea in North Carolina. Cold damage was observed on several pea genotypes across the sites, but this injury was transient and the peas were able to recover by early March. Experience working with many pea genotypes over the past several years indicates that there could be some cold damage (foliar necrosis) following very cold weather events but most pea genotypes will survive the North Carolina winter. Legume disease incidence: Pea continues to be the most susceptible winter legume cover crop to disease in North Carolina. Pea production should be avoided on fields with a history of Sclerotinia pressure. The Kinston site had Sclerotinia pressure and this greatly restricted cover crop biomass production late in the season. Other pea diseases observed included powdery mildew and Ascochyta blight, but these appeared to have a minimal impact on biomass production. 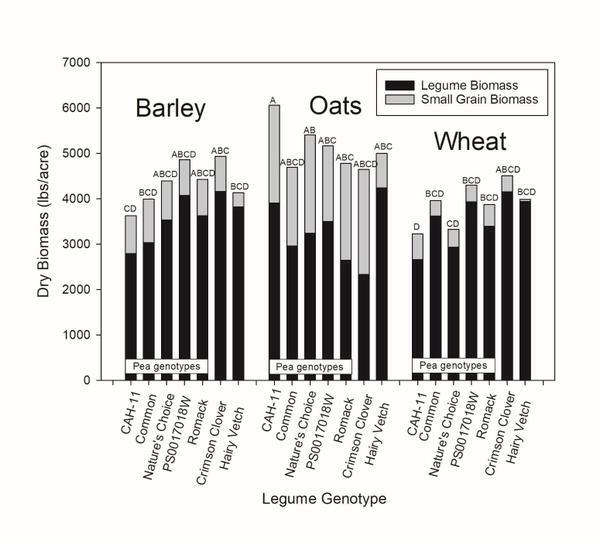 Coastal Plain biomass production: At the Coastal Plain sites, total biomass production was between 3,250 and 6,000 lbs/acre and the mixture was generally dominated by the legume (Figure 1). At these sites, lack of added nitrogen fertilizer resulted in an environment conducive for better legume growth and minimized competition from the small grain. 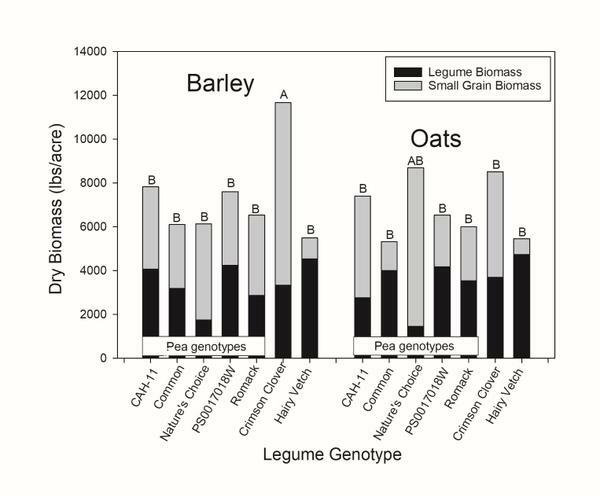 Biomass production did not differ among the legume genotypes in mixture with small grains at these sites (2,300 to 4,200 lbs/acre), which indicates that peas can produce as much biomass as crimson clover and hairy vetch in mixture (P=NS). Hairy vetch was more competitive than crimson clover or pea with the small grains in mixture and this led to little small grain production in mixture with hairy vetch. Oats produced more biomass in mixture than wheat or barley, and therefore lead to greater total biomass production. At sites with low residual nitrogen as often experienced in the Coastal Plain, oats might be a more appropriate choice for production in mixture with a legume cover crop than wheat or barley if the producer is targeting a homogenized mixture of the legume and small grain. Piedmont biomass production: At this site, cover crops were planted in late September and wheat growth was severely inhibited by Hessian fly. Cover crop wheat is often planted earlier than wheat for grain; if producers are going to plant their cover crop mixtures before the Hessian fly free date they should exercise caution using wheat for risk of Hessian fly damage. Some barley genotypes are also susceptible to damage from Hessian fly. Barley and oats produced similar biomass at this site (P=NS). Total biomass production was between 5,250 and 11,600 lbs/acre at this site (Figure 2). Several pea genotypes produced as much biomass as crimson clover and hairy vetch (>3000 lbs/acre), however pea biomass was reduced with Nature’s Choice, the pea cultivar widely available in North Carolina (1440 to 1700 lbs/acre, Figure 2). Considering the small grain was seeded at approximately 30 lbs/acre, the small grain biomass production in mixture was impressive at this site except when produced in mixture with hairy vetch. Similar to the observations in the Coastal Plain, hairy vetch was very competitive with the small grain in mixture and restricted small grain biomass production. 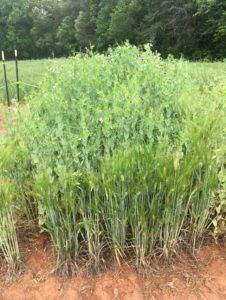 Pea and oat mixture at the Central Crops Research Station in Clayton, NC. Crimson clover and barley mixture at the Upper Coastal Plain Research Station in Rocky Mount, NC. Pea and barley mixture at the Piedmont Research Station in Salisbury, NC. Figure 1. Cover crop biomass in a combined analysis of the Coastal Plain sites (Clayton 2016, Clayton 2017, Kinston 2016, and Rocky Mount 2017). Mean separation letters are used to differentiate total biomass production of the cover crop mixtures. Figure 2. Cover crop biomass at the Piedmont site (Salisbury 2017). Wheat had very poor survival at this site due to Hessian fly pressure following an early cover crop planting date (late September) and was excluded from the analysis. These results show that some pea genotypes are capable of producing as much biomass in mixture with small grains as crimson clover and hairy vetch. Hairy vetch was very competitive with the small grain in mixture and restricted small grain biomass production. Oats may be more appropriate for growth in mixture with legumes than barley or wheat at sites with low residual nitrogen because oats are more competitive in mixture. Oats may also be less susceptible to Hessian fly damage. Cereal rye was not evaluated in this study, but is also a popular small grain choice for cover crop production in North Carolina. Residual soil nitrogen and added fertility will influence cover crop species performance in mixture; this underlines the importance of understanding site history when making decisions on mixture seeding rates. A big thank you to the Southern SARE (GS14-135) and the NC Dairy Foundation for supporting this research.